With a stay at Scarlet Dago Hotel in Bandung (Coblong), you'll be within a 15-minute walk of Sasana Budaya Ganesha and Bandung Institute of Technology. Featured amenities include dry cleaning/laundry services, a 24-hour front desk, and luggage storage. A roundtrip airport shuttle is provided for a surcharge (available on request), and free self parking is available onsite. 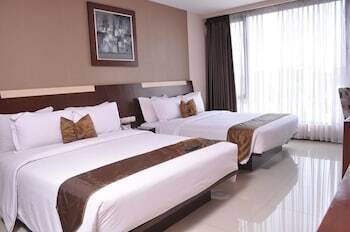 With a stay at Airy Pasteur Djundjunan 153 Bandung in Bandung, you'll be a 2-minute walk from BTC Fashion Mall and 14 minutes by foot from Maranatha Christian University.